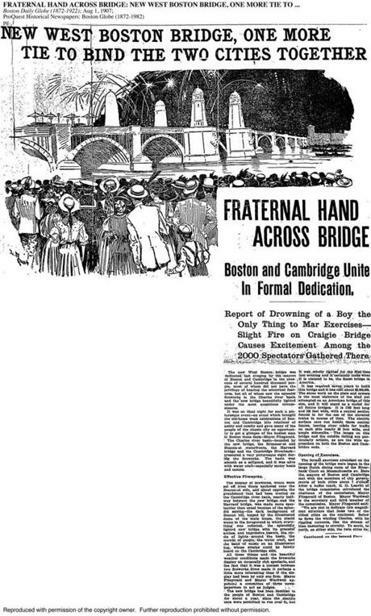 The Boston Daily Globe covered the construction and the dedication of the Longfellow Bridge. For the first time since the conclusion of construction on the Longfellow Bridge in 1907, two of the towers are coming down, temporarily. As reported in Saturday’s Globe, construction crews are taking painstaking measures to remove, clean, and replace each of the four towers’ 529 granite blocks. For most of the past century, the Longfellow has been Boston’s most iconic bridge (though the Zakim now offers a run for its money). Still, many people may not know why, after the bridge’s completion, it was named after the poet Henry Wadsworth Longfellow. Obviously, Longfellow was a cool guy: He wrote “Paul Revere’s Ride,” his bust resides in Westminster Abbey, and he was buddies with Nathaniel Hawthorne and Ralph Waldo Emerson. But fewer may know that the grand structure connecting Boston and Cambridge was christened in his name because of a poem he wrote about the bridge that was there previously. 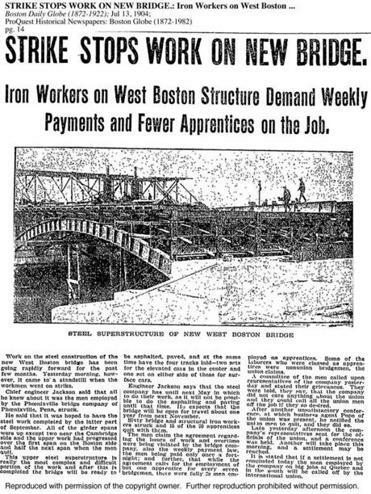 Part of that poem (aptly called “The Bridge”) was read aloud by Boston’s mayor, John F. Fitzgerald, at the Longfellow Bridge opening festivities on July 31, 1907. It’s a feeling that is probably familiar to anyone who commutes home on the Red Line. Sometimes, it feels like transportation is a zero-sum game. Saturday morning, fresh off the high from the news that the Callahan Tunnel would open two days early, on Monday — welcome relief to anyone who has tried to get to the airport on a weekday afternoon this year — I drove to Newton for a run along the Boston Marathon route. To my shock, even though it was 8 a.m. on a weekend, the Massachusetts Turnpike was snarled with traffic, a long line of vehicles moving at a glacial pace in either direction. It turns out that MassDOT was testing out an abbreviated version of lane restrictions that will affect weekend travel for the next month and a half. Now that the Callahan construction is over, transportation officials are able to make way for a construction project on the Back Bay tunnel of the Pike that will cause major weekend backups. The reason: Folks from the Hynes Convention Center need to repair the concrete slabs above the Pike that prevent conventioneers from hearing the sound of honks and zooming cars drowning out the sound of their seminars, according to Highway Administrator Frank DePaola. To make that work possible, MassDOT and State Police must route both directions of traffic into a single side of the tunnel, allowing construction crews free rein in the other side. Traffic will be funneled down to a single lane in each direction, separated by a line of cones, before crews switch to the other side of the tunnel. The full lane restrictions will take place from Friday at 9 p.m. to Monday at 5 a.m. over the course of four weekends: March 21 to 23, March 28 to 30, April 4 to 6, and April 25 to 27.